Our intrepid foodies pick their favorite new places to eat. Heavenly: Asiate (Photo by Kenneth Chen). 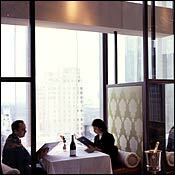 With its gleaming room, buoyant staff, and a menu that fuses Asian spice with the extraordinary technique of chef Nori Sugie, Asiate would bring you closer to heaven even if it weren’t on the 35th floor. Tom Valenti could cut his menu in half and there’d still be enough fine Italian grub left over to feed a sizable army of Vikings. I could spend weeks at the bar, chatting with all the neighborhood fressers, eating nothing but hot pork sandwiches, slices of stromboli, and bowls of the chef’s delicious farro salad. From quirky salads like wilted escarole with hot anchovy dressing to tangerine-olive-oil cake for dessert, Sara Jenkins makes a delicious case for seasonal, idiosyncratic cooking. Her pastas are particularly stunning: bucatini anointed with black-kale purée; pappardelle blanketed with wild-boar ragù; the ultimate macaroni and cheese. And the low-key, unpretentious setting suits her style—and mine. Imagine your favorite neighborhood watering hole—all tight tables, great tunes, high-spirited bonhomie—but blessed with a serious kitchen, and you have the Spotted Pig. 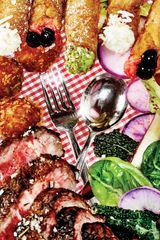 April Bloomfield’s astonishing pub grub by way of London’s River Cafe makes as much of seasonal vegetables as shepherd’s pie, and her sheep’s-milk gnudi has already become one of the hottest dishes in town.